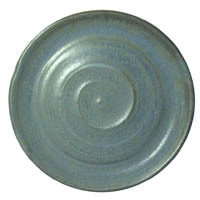 This is a high alumina matte glaze and is a favorite. It is not temperature sensitive and produces good results at cone 5, 6 and 7 (medium blue surface breaking an olive type green where thin). Most base glazes do not host alumina well and fire with pitting and uneven surface (alumina is very difficult to melt and dissolve). Be sure to use a smallest particle sized alumina you can find (it is available in very fine grades, much finer that the average ceramic material).